I have been participating in a blog circle with some wonderful photographers who are also mothers of girls. Each month, we write a letter to our daughters to preserve thoughts and memories of this time in our lives. I treasure being able to do this for my girls and I love the chance to see the messages that my friends leave for their own daughters. Once you have read my letter, please follow continue on to see what Jennifer Vititoe wrote to her daughter by clicking HERE. Hey look, it’s us! The whole family! 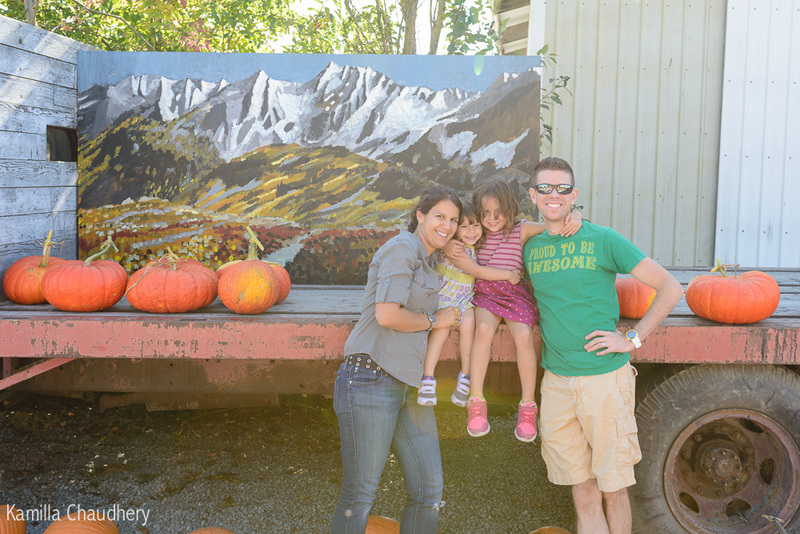 We went apple picking recently with Uncle Julius and Aunt Cristina (plus Max-the-Dog). Julius was nice enough to take this picture of us. We don’t have enough pictures of the four of us together, and I love them even if I am not necessarily looking my best, because I love our family the most of anything in the whole wide world. But most of the pictures I am going to use in this letter are actually a few weeks old. Late this summer, we bought a butterfly garden kit. I sent away for the caterpillars and we received a small cup in the mail with 5 of them and a weird peanut butter type substance that served as their food. They ate and ate, doubled in size about everyday, and finally each formed a chrysalis. 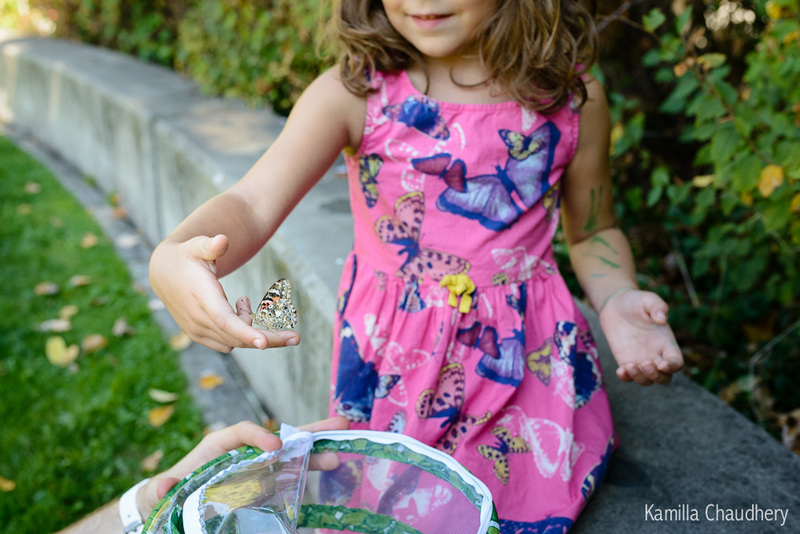 Then the butterflies emerged and we had them in our house for a few days. You are supposed to release them after about 5 days, but we waited a little longer. You wanted to wait until Dad could be there before we released them, and I wanted there to be nice light, so we waited about a week later than we should have. Then I realized that they were mating like crazy and filling their garden with tiny little eggs (you can see the little pale blue eggs on the (quickly rotting) peach slices above). I was afraid that they would die on us, but we finally managed to release them. Avery, you wore your butterfly dress for the occasion. 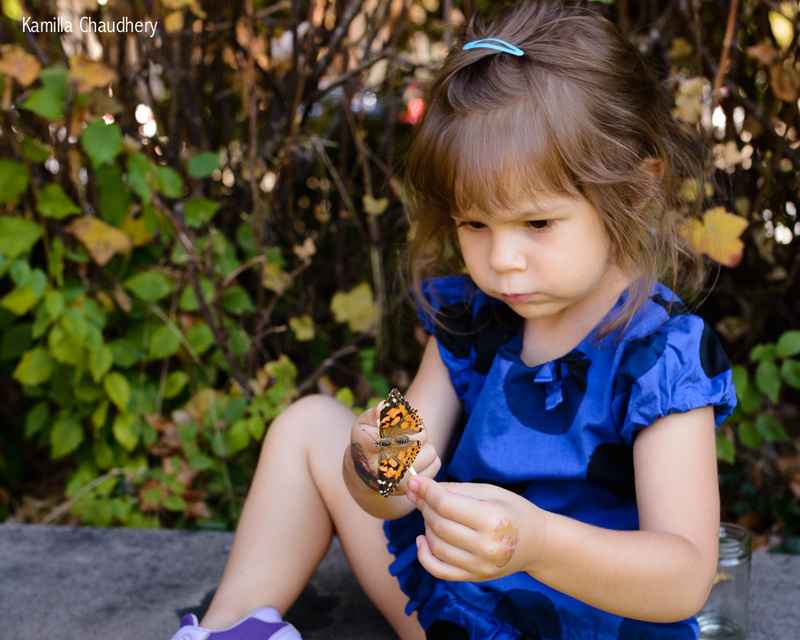 It was so cool to get to see how well you did, treating the butterflies gently, and to see your expressions. You each took turns, reaching into the garden and bringing out a butterfly. One by one, they flew away. I know that it is a bit of a silly metaphor, but I think of you girls and how you are my butterflies. Just like them, you will probably be ready to fly away before I am quite ready. In fact, we were supposed to move the butterflies from the little cup into the big garden as soon as they had formed their chrysalis. But we procrastinated, like I usually do, and I was in denial. 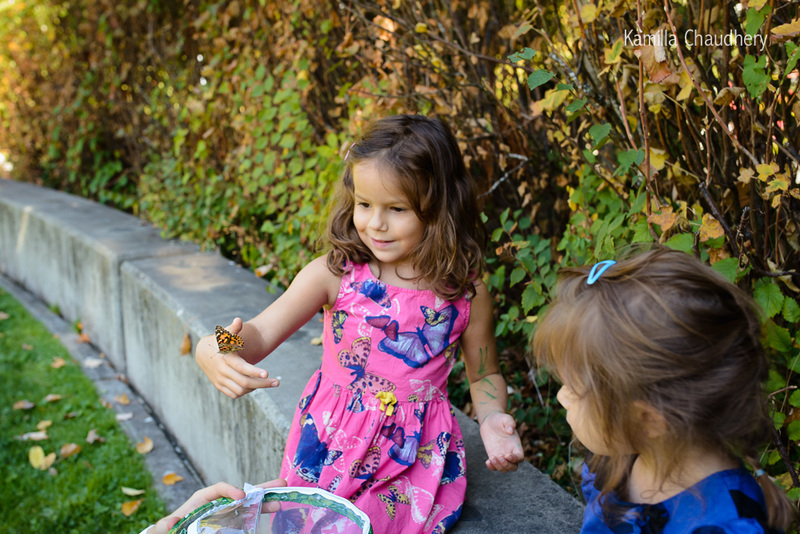 The instructions said the butterflies would take 7-10 days to emerge, but it was wrong – ours were faster. Or was it that I counted wrong, that my sense of the time was different? 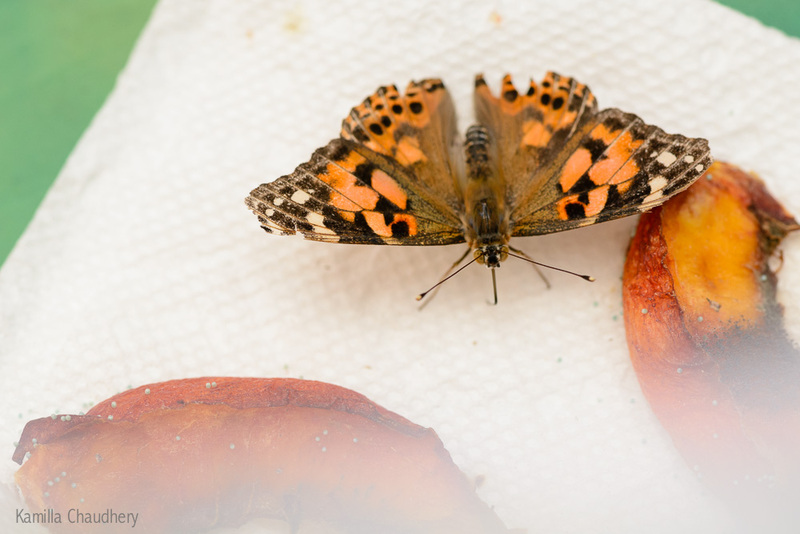 In any case, those first two butterflies emerged still in that tiny cup instead of in the big garden. 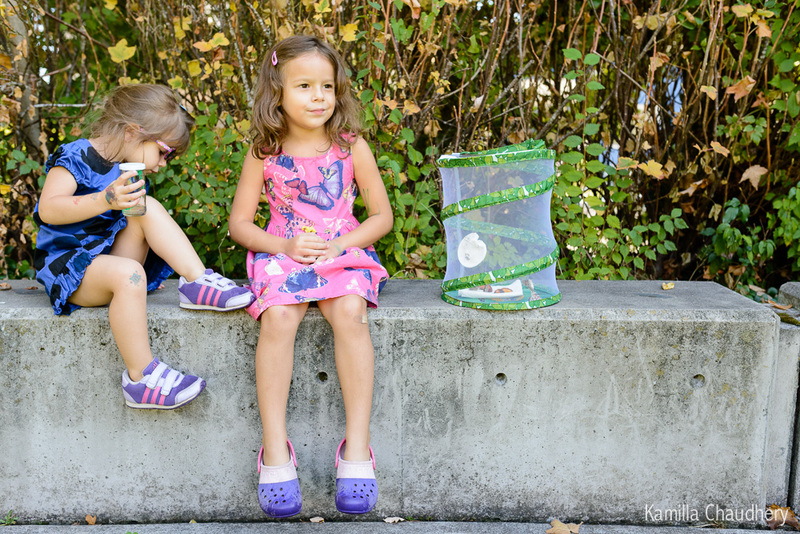 And there we were, running about on a hectic weekday morning, trying to get you ready for school, only to be surprised by the sight of a butterfly in that tiny container. The big change had occurred and we were too caught up in the day-to-day to realize. We had to move them all right away, and emerging into that tiny container might have damaged the wings of one butterfly, which were just a bit wonky. I don’t want that to happen to you. I know that my job right now is to keep you safe and growing, but I promise to make sure that you will also have room to spread your wings and fly. I love you. 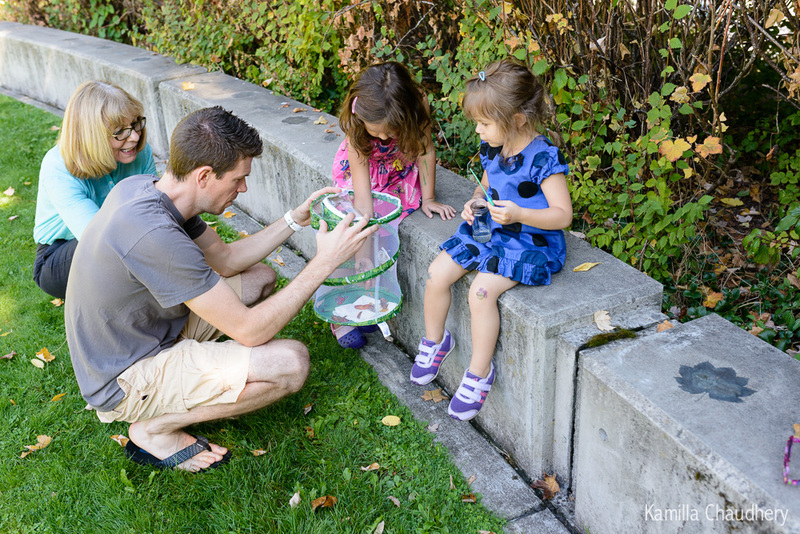 That’s really neat you and the girls nurtured some caterpillars until they turned into butterflies! Avery looks so happy with them!